It is unfortunate that what will probably be an entertaining evening of song and dance is being used as political propaganda posing Pacific islanders as victims of global warming-caused sea level rise that will inundate their homes. Such propaganda is not new. Back in 2009, Members of the Maldives’ Cabinet donned scuba gear and held a meeting under water in a publicity stunt about sea level rise. The UA’s Institute of the Environment has also, in the past, issued alarmist articles about sea level rise flooding low-lying coastlines, see Science Fiction from the University of Arizona. If you decide to go to the afternoon discussion, here are a few things you should know. Auckland University Professor Paul Kench has measured 27 islands where local sea levels have risen 120mm – an average of 2mm a year – over the past 60 years, and found that just four had diminished in size, the remaining 23 had either stayed the same or grown bigger, according to the research published in a scientific journal, Global and Planetary Change. 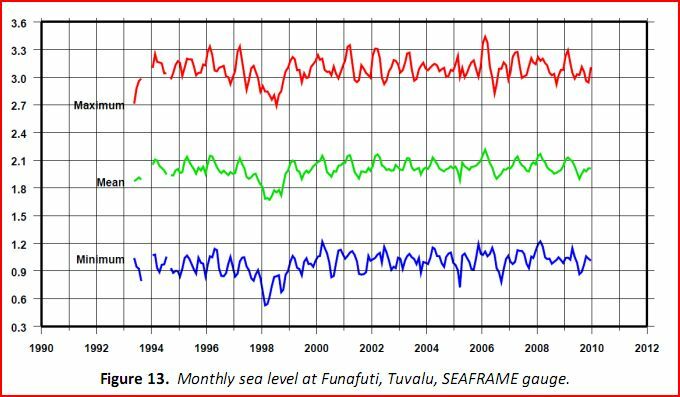 Here is the Australian record of sea level for Tuvalu. Other South Pacific islands show a similar record. The Maldives are so concerned about rising sea levels that they have upgraded one airport and building a new one, as well as expanding resort locations on various islands to attract tourists. These would be tourists from the developed world and the very ones endangering their country. And flying there! It would make more sense if they had to come by yacht or some sort of solar powered craft.